In 2003, the bombing range was closed. But Vieques faces other challenges, like unemployment, crime, and basic infrastructure issues like health and transportation. The principal means of transportation between Vieques and the main island of Puerto Rico is the ferry that travels the 30 kms between the town of Fajardo and the pier at Vieques’ Isabel Segunda village. The service is plagued by frequent breakdowns and delays, a situation which discourages tourism and makes life difficult for Vieques residents that need to travel to the main island. Rabin works at the Conde de Mirasol historic museum in Isabel Segunda and at the newly founded Radio Vieques community radio station. He pointed out that the island town of Culebra, some 15 kms to the north of Vieques, faces a similar transportation plight. “This shows the Puerto Rico government’s lack of commitment to the economic development of both Vieques and Culebra,” he said. Local residents of both islands feel squeezed out by a large influx of wealthy new residents – mostly U.S. citizens – which is allegedly causing “gentrification”. Rabin says that this type of population displacement is also happening in the main island and in the nearby Virgin Islands. “I see an increase in the control of foreigners, especially American, over local tourism. The government has not responded to this problem. And the local community has not been able to respond in a coherent way due to lack of organisation,” he said. Not all “snowbirds” are rich property owners. Some come for high-paying jobs in the tourism and construction sectors, others work as carpenters or electricians. The poorer ones live in camping tents in Sun Bay beach, in the island’s south coast. 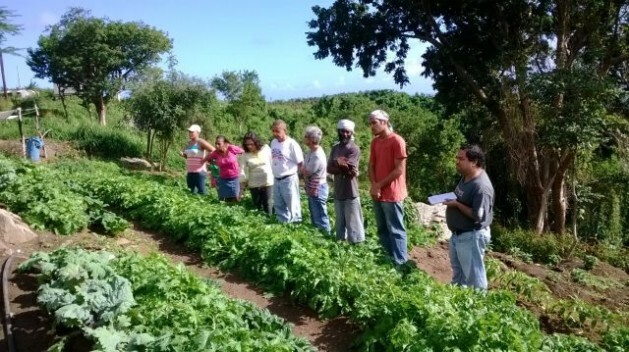 Vieques has been experiencing a renaissance of sorts in its farming sector. New farm operations, both conventional and organic, have been sprouting up in recent years. One of these nouveau agricultural operations is the small company Hydro Organics, which is working a 30-acre farm called La Siembra de Vieques, located between the Lujan and Esperanza sectors. La Siembra grows squash, green beans, papaya, moringa, avocado, coconut, eggplant, pineapple, guava and salad greens, among many other crops. Part of the labour is provided by woofers, international backpackers that travel from one farm to another, working in exchange for lodging and food. The farm is run according to the principles of permaculture, a discipline that combines ecological design and sustainable agriculture. In Monte Carmelo, a hillside sector next to the old Navy firing range, is the farm of Jorge Cora. He has no running water or electricity and there is no paved road leading to his farm. He plants salad greens, okra, peppers, tomato, basil, neem, tobacco and beets, all without the use of agrochemicals. But there is debate as to whether Vieques farm produce is safe to consume. Some point out that all of the island’s settlements are downwind from the old firing range, where shells of different calibres were exploded over 60 years, blowing up dust and debris contaminated with munitions toxic chemicals, which were carried by the winds and settled in the civilian area. In the 1990s, the Puerto Rico Health Department determined that the cancer rate among Vieques residents was 26.9 percent above the national average. The anti-Navy movement attributed this anomaly to toxic pollution caused by military activities. Biologist Arturo Massol, professor at the University of Puerto Rico and volunteer staffer at the non-governmental organisation Casa Pueblo, carried out peer-reviewed studies of military pollution in Vieques and how these toxins travel the marine and land food chains. He believes there is reason for concern, but advises that more studies need to be done. “The soils in Vieques could be safe for farming, or maybe not. There is uncertainty,” he told IPS. Massol declared that the Puerto Rican government has a duty to carry out soil tests to ascertain any toxic hazard. For its work with the people of Vieques and the anti-Navy protest movement, Casa Pueblo won the prestigious Goldman Environmental Prize in 2002. Your title is way off target. Instead of celebrating and promoting the deeds of farmers, your PR article attacks innocent people for no reason. Thank you Juan I share you same sentiments on this article, I must also add it was all over the place. In fact he is right – they are foreigners. Puerto Rico & Puerto Ricans have NEVER accepted occupation by the USA. Well ok….. Why don’t we do this… Why don’t all the Puerto Ricans ( millions ) living in the US return to PR and all the North Americans can go find other tropical islands to have vacation homes. We’d happily accept that trade. As usual, stupidity and white arrogance reigns. Don’t stop there. Why don’t ALL citizens of the USA from around the world, get out of other people’s land (including Diego Garcia, Hawaii, Samoa, Iraq, Syria, Afghanistan, Nigeria and each of the 950 bases sitting on somebody else’s land) and return to North America. That’s YOUR logic. Stupid people with their stupid remarks troll the internet.